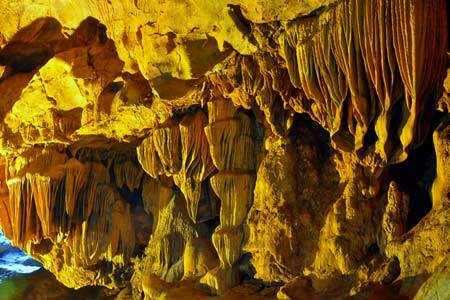 Nguom Ngao Cave is situated in Gun Hamlet, Dam Thuy Commune, Trung Khanh District of Cao Bang Province. From Cao Bang Town (Cao Bang Province) go 60km past the Ma Phuc and Khau Lieu Passes to reach Trung Khanh Town. From there, go 26km further, and you will arrive at Ban Gioc Waterfall before visiting Nguom Ngao Cave which is 3km away. In the Tay language, Nguom Ngao means Tiger Cave (Nguom: cave, Ngao: tiger). Legend has it that in the past there were many dangerous tigers living in this cave. Some people say that the name of the cave originates from the fact that the sound of a running stream in the cave sounds like the roar of a tiger. This cave is also called Wind Cave because inside the cave there is an underground stream which flows very fast, creating a gust of wind and a loud echo in the mountains. Some French people and Vietnamese mandarins discovered this cave when they visited Ban Gioc Waterfall in 1921. The temperature inside the cave ranges between 18-250C so it is cool in summer and warm in winter. 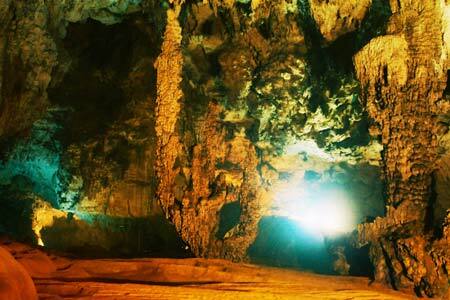 Nguom Ngao Cave is 2,144m long and has three main gates, including Nguom Ngao, Nguom Lom and Nguom Ban Thuon. People visit the cave through Nguom Ngao gate near Gun Hamlet and can go 1km deep into the cave. 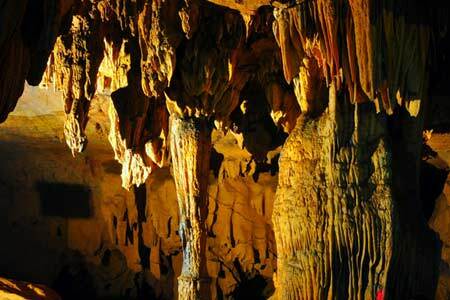 According to scientific research, Nguom Ngao is a karst cave formed nearly 300 million years ago. 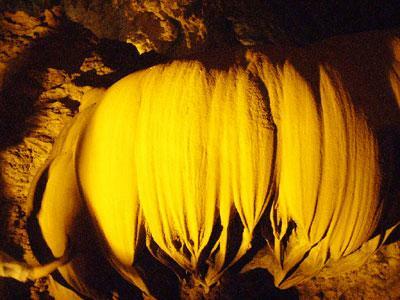 Stalactites and stalagmites in the cave create lively, splendid scenes fascinating visitors. With some imagination visitors named the stalactites and stalagmites after Vietnamese beliefs. The cave is divided into different sections, such as the “four highest-ranking court officials” section with stone pillars looking like they are propping up heaven. The central section has a large space and the treasure section has stalactites that sparkle in gold and silver colours. The colours of the stalactites and stalagmites in Nguom Ngao Cave are quite different from those of other caves because the calcium in the stone has many impurities. On the walls of the cave there are many beautiful stalactites. One looks like a dodder tree, while others look like a mother’s breast, a sacred frog, or a stone musical instrument. The most outstanding features of the cave are stalactites and stalagmites in the shapes of a ship, a golden waterfall, a silver waterfall, an upturned lotus-shaped pedestal and a lonely stone pillar. Nguom Ngao is really an invaluable gift that nature has given to the local people.